Family: Anastasia is usually close to her family, and loves spending time with them. Now, as a wandering superhero, she rarely gets the time to do that. Bushroot: Reginald Bushroot used to be her friend when they were kids, but they were separated when she and her family left. She was soon reunited with him after many long years, and though they don’t remember each other anymore, they form a close bond when she befriends him and tries to help him reform. Darkwing: Harmonizer is on good terms with Darkwing. He occasionally sees her as yet another superhero trying to steal his thunder; she views him as a friend. Harmonizer is a tomboy, a trait she always had with her growing up, and she’s never afraid to stand up for things she believes in. She can be hot headed at times, but she always tries to refrain from too much violence. If things get too much, though, she snaps, and, well… the offender will need to be very lucky to escape unharmed. She is very friendly, and caring, which allows her to befriend Bushroot. She is easily amused; just about anyone can make her laugh. Her stubborn nature causes a lot of problems, to herself and to people around her, when she refuses to accept help for things she couldn’t handle alone. If the right strings are pulled, she can be very trusting. And as a rogue hero, she is more towards helping people than abiding the law, though she does try to follow the law. Most of the time. Anastasia was born to a loving family, who cared and cherished her every moment of her life. As the first-born offspring of an Octave, she naturally gains the powers to make people dance to her will by playing an instrument. She soon became good at it, and she even found her soul instrument, a harmonica. Her family made sure her powers stayed hidden from anyone else. As a child growing up in St Canard, Anastasia Octave befriended Reginald Bushroot after saving him from a group of bullies. Since then, they were close friends, always doing everything together. It all changed a few months later (Anastasia was ten by then), when Anastasia’s mother was accidentally murdered by her mad ex-fiancé, who had been tracking her for ten years. This threw off Anastasia’s control over her Octave powers forever when she witnessed her mother’s death, and her powers went wild. She attacked, and nearly killed, the people who did this, until she was stopped by her father. They then escaped to Duckburg, hiding out for six months, before moving to France, where her father used to live. Anastasia learnt the truth about her family. 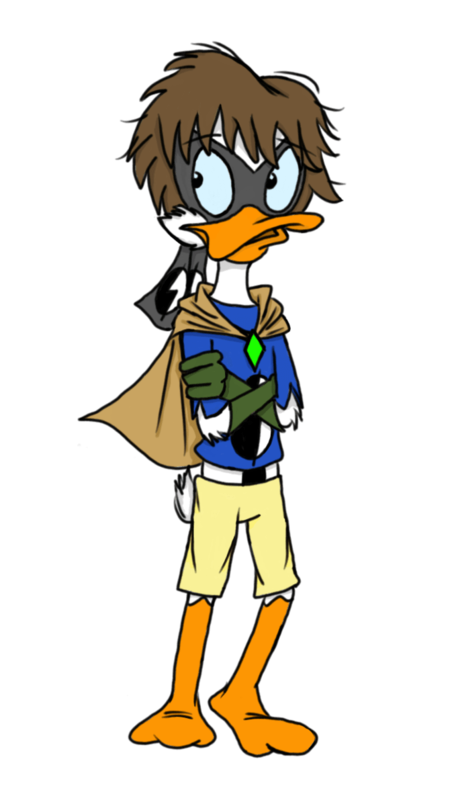 They used to be in France, and her mother had been forced into a marriage by a powerful and influential man a long time ago, until her father, the anti-hero Duck Piper, rescued her and married her instead, them being secret lovers for a long time. They then had to flee to St Canard to hide from her ex-fiancé. As things had turned out… it didn’t work. Anastasia stopped using her powers completely, when she found out how unstable, and very dangerous – especially considering anyone who heard it would twist into grotesque shapes – they were, and her father found her a martial arts master in France to train her in the arts of ninjitsu. It took her a long time, and she had to face many challenges and obstacles, but she soon mastered it in place of her powers. By then, she had grown into a woman. She soon discovered her true calling as a superhero on the night of her prom at high school, when she skipped the party, and her date, to stop a robbery from happening. She then discovered how she liked fighting crime, and righting wrongs, and she soon went about as a wandering heroine by the name of Harmonizer, like the name of her soul instrument. She fought crime, travelling around many cities, eventually returning to St Canard briefly, and was recruited into S.H.U.S.H. by J.Gander Hooter for her crime-fighting expertise. Unfortunately, this relationship was short lived when she discovered weeks later, purely by accident in the evidence room of S.H.U.S.H., a file marked ‘Octave’. Examining its contents soon led her to find out how S.H.U.S.H. had been watching her and her family the whole time when they had been in St Canard, mainly to ensure the citizens’ safety. It angered her, not because they had been keeping tabs on them, but because they were clearly there that night her mother was murdered, and did nothing to prevent it. She confronted Director Hooter about this at once. He was alone, and it was late at night, so there weren’t people around in S.H.U.S.H. It soon got violent, with her never giving him a chance to explain, but before Harmonizer could hurt Hooter, Agent Grizzlikoff managed to step in and stop her. She then left in a rage, with a grudge against the whole organisation.